Former Governor of Delta State, Chief James Ibori, who has been in the eye of the storm over corrupt allegations leveled against him, his aide and some members of his family, both here and abroad, yesterday launched a scathing attack on the former chairman of the Economic and Financial Crimes Commission, EFCC, Mallam Nuhu Ribadu accusing him of carrying out a personal crusade against him because he (Ibori) refused to lobby so that he would be made Inspector General of Police. 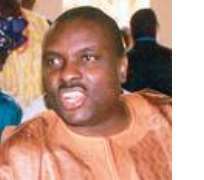 Ibori, who narrated the intrigue and horse trading that trailed the nomination and election of former president Olusegun Obasanjo in 2003, said that his initial stance against the nomination of then president Obasanjo could be the genesis of his problem which Ribadu spearheaded. Ibori who did not hide his influence in the corridors of power at a media chat in Lagos yesterday said his problem started when he said that Former President Obasanjo was not Sellable,” Electable and Markettable”. He said that President Obasanjo after his election confronted him and that he would make sure that he( Ibori) is not marketable , sellable and electable. The former governor who said that he has not spoken with or called the former president since he left office Ribadu descended on him because he could not use him to actualize his ambition. Asked how Ribadu could have been close to him knowing that he was being investigated for corruption, Chief Ibori said he knew what he was talking about and refused to elaborate. He also debunked Ribadu,s allegation that he bribed him with 15 million dollars saying that the mere fact that Ribadu and his aides have made contradictory statements on the same allegations claiming that he was sure that the court would dismiss the bribery allegation. When asked if the CBN did not issue a receipt for the alleged money, chief Ibori said that the issue would determined by the court.For the last two years and four months since I left office, there have been several questions about my stewardship as Governor of Delta State. I have refrained from joining issues'-with any person for two reasons: some of the allegations made against me are already being tested in court, and it has been my policy to be reticent about certain issues. Against the backdrop, however, of recent increasing negative media campaigns against me, which have motivated my political associates, friends, colleagues and well-wishers to mount pressure on me to react to these allegations, I-have chosen to come out of my reticence to address some of these issues. I am aware that there is a coordinated network of different websites and newspapers that have vowed to sustain their campaign against me until I am destroyed. Some of them have packaged me as the face of corruption; others have branded me as the greatest obstacle to Nigeria's development. I am certainly none of the above. It is not in me to malign anyone's character but address the facts of the matter as they are. In doing this, I am compelled to go back to the roots of my present challenges. In 1998 when I went round the nooks, crannies and creeks of Delta State, campaigning for the 1999 election, the practice of true federalism was my ideological anchor. I promised Deltans that, if handed the mandate, I would use my office to advocate Nigeria's return to the practice of fiscal federalism and resource control. I did not renege on this promise. Those who have kept abreast of goings-on in the political space within the past few years will testify to my advocacy of resource control. The 1999 Constitution states explicitly that 13% shall be paid as derivation to constituent units for natural resources. This payment to the oil-producing states should have started in May, 1999, but President Olusegun Obasanjo refused to implement it. In March 2000, I mobilized the Governors and Legislators of the South-South region to Asaba, the Delta State capital, to press for its implementation. At the end of that summit we issued a stern communiqué. President Obasanjo who was compelled to pay in April that year deeply resented my outspokenness, and I entered his bad books for disagreeing with his policy of retaining a large chunk of the oil revenue at the centre. Of course, I continued my advocacy of resource control. Many will recall that I even took the advocacy to London (Ibori Vanguard Lecture in London on 12 August, 2001). Around November 2002, 15 of the 21 Governors from the PDP including me, had an ad hoc meeting at my lodge in Abuja to decide who should be nominated by the Governors' Committee for election by PDP as the presidential nominee for the 2003 Election. The Governors' Committee decided almost unanimously to get a new candidate instead of President Obasanjo as the Committee was of the view that because of his military background, he was intolerant of dissent and had displayed very dictatorial and vindictive tendencies against those he perceived to be independent-minded and disloyal to him. Immediately after the Governor's meeting, I led the delegation of Governors to meet the then PDP Chairman, Chief Audu Ogbeh, at his residence around 2 am. As the leader of the delegation, I spoke and communicated the views of the Governors to the Chairman, which was that the Governors had decided not to support President Obasanjo as PDP's nominee for the 2003 General Election. The party chairman tried to persuade us to review our decision but when he saw our resolve, he told us that he would inform the President. I was later informed by Chief Audu Ogbeh that after we left his house he put an urgent call to the President and informed him of our decision. What then followed were intense consultations before the PDP annual convention which took place in January 2003. Two days before the party convention, the Governors had a breakfast meeting with President Obasanjo. I recall that at that meeting, the then Vice President Alhaji Abubakar Atiku told the President in the presence of the Governors that he was known to be very dictatorial, vindictive and unforgiving. The President appealed to the Governors to support him and assured both the Governors and the party leadership that if he was allowed to continue for the second term, he would adopt a more democratic approach. On the basis of the President's assurance, given at that breakfast meeting, I led the move for the Governors to support his presidential nomination for the second term. However, notwithstanding my support for President Obasanjo's s nomination for a second term, the President after the nomination, acted very shabbily towards me. When I met him soon after the convention, he told me that he had learned that I had put forward the view that 'he was unsellable, unmarketable and unelectable.' He then vowed that he was going to make sure that 1 was “unsellable, unmarketable and unelectable”. The Charges Against Me I was arrested on the 12th of December, 2007 at about 9am and charged the following day which is 13lh of December 2007 in Kaduna which is about 650 kilometers away from the jurisdiction where the alleged crime was said to have been committed. I was denied bail and kept in detention for 62 days, the longest ever, in the history of Nigeria with respect to this kind of political case. My lawyers challenged both the detention, the jurisdiction of the court and the seizure of my passports, all of which was vigorously argued at the lower court and -at the appeal court. It was finally resolved at the appeal court where the court agreed with my lawyers that the jurisdiction where the alleged crime was committed is the Benin Judicial Division, and the case was finally transferred to the Benin Division. The appeal court also granted the release of my passport. All of this, 1 think, did not go down well with the erstwhile EFCC Chairman. Since my arrest, 'detention and eventual prosecution, my team of lawyers have consistently assured me that 1 will be fully exonerated because there is no evidence to support the charges. $15million Bribe In November 2007,1 was in New York attending the UN session with the Nigerian delegation as an observer. While I was there, 1 heard from a friend that the erstwhile EFCC Chairman was going to frame me that I had attempted to give him a bribe of US$ 15 million. I can categorically say that I never made any such attempt and this allegation is nothing but an attempt to frame me with false-and fabricated evidence which only exists in erstwhile EFCC Chairman's imagination. As soon as I beard this, I placed a call from New York to the ex-chairman and asked him pointedly if what I heard was true. He denied it. Interestingly he himself has contradicted his statement severally with regards to the alleged bribe especially in his witness statement in the English court. He claims that I was present when the money was given to him, while in the statement he made in the Nigerian court, he says that he sent an officer of the EFCC Mr. Ibrahim Lamorde to collect the money from Dr. Andy Uba, who was President Obasanjo's personal aide. There is therefore a material difference in the two versions of his statements. My Relationship with the Erstwhile Chairman of the EFCCI can say without any fear of contradiction that 1 have and I hope I still have a good relationship with the erstwhile Chairman of the EFCC even though he now denies that he is a friend. I am a Christian and will not deny him. Very many times he tried to get me to assist him in one way or the other, including his desire to become the Inspector General of Police. In his approach, he posited that in his estimation and knowledge of Nigerian politics, I was one of those who could help him achieve it. On another occasion he attempted to recruit me to join in his crusade to annul the Presidential Election of 2007. In fact, he promised that if 1 did, he would not file charges against me and would not prosecute me. I told him to give me time to reflect on it. But it would be stupid of me to have bought into his blackmail; so I ignored him. When he then realized that I was not succumbing to his cheap blackmail, he decided to go ahead with his plan of humiliating me. The Niger-Delta I believe that the Yar'Adua Administration is on the right path in finding a permanent solution to the Niger Delta crises. The amnesty that has been granted is good to the extent that it has given freedom to the likes of Henry Okah. Many of the youths are also embracing the amnesty. For that, we thank President Yar'Adua. 1 am optimistic that most of the aggrieved youths, if not all, will embrace the Federal Government's amnesty and lay down their weapons and Integrate themselves with other members of the society. I also believe that the next stage after the amnesty is to engage the leaders of the region in the resolution of the question of fiscal federalism. I believe that while that discussion is going on, efforts should be made to have a coordinated approach to the infrastructural development of the Niger-Delta. The states, the local governments, intervention agencies and the Federal Government should have a common approach to the building of schools, roads, bridges, hospitals and all manner of infrastructural facilities and social amenities in the region. Many more leaders are joining in the effort to find a solution to the crises in the Niger Delta.